The team was called in the early hours of Sunday for a report of a walker overdue from a trip up Scafell Pike. A search started at first light and when the walker was not found in the first few hours the effort was ramped up with search groups from Duddon and Furness, Cockermouth, Keswick, Penrith and Kendal teams along with Lake District Mountain Rescue Search Dogs and RAF Leeming. 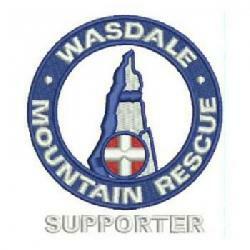 Conditions on the mountain were difficult with dense mist and strong winds and the missing walker was not located. The search resumed at first light today with teams from Wasdale, Coniston, Langdale, Kirkby Stephen, Patterdale and Cockermouth along with RAF Leeming, search dogs from the Lakes and SARDA England and the coastguard helicopter from Prestwick. The remaining Lakes teams stood by to cover any other rescues that might occur. Tragically, a body was found in the morning in Piers Gill by the Cockermouth team and then recovered. We would like to thank all the teams of the Lake District, the search dogs some of whom had travelled from the Peak District, RAF Leeming and Rescue 199 for their massive support on this rescue. Our thoughts are now with the family and friends of the walker.